Keeping up with your yoga during the holidays can be hard for many reasons. You want to spend more time with your family, travel around, take care of things you couldn’t do otherwise; all those activities leave little time for yoga. Moreover, the motivation level is also low as you want to take a break from the routine. 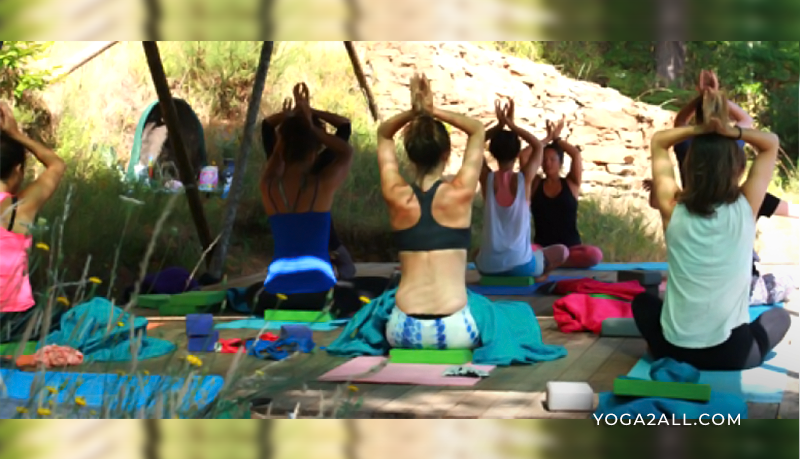 There are several little things you can do, however, to get all the benefits of yoga and also enjoy holidays at the same time. The biggest hurdle in doing yoga during the holidays is your mind. It keeps thinking that you’re too busy to practice, busy with shopping, traveling, and eating. The trick to keeping yourself motivated is to commit to doing yoga for just ten minutes every day. That’s all it takes. Roll out your mat, practice for ten minutes. After getting on the mat, if you feel like going on, by all means, do so. All you have to do is get yourself onto that mat for ten minutes. Whether you were tucked up in bed at 10 pm or stumbled home at 4 am, start your day with yoga. There’s no better time. You’ll most likely get occupied during the day, so just drink a glass of water and get onto the mat. If you feel too tired, do simple exercises like sitting in child’s pose or corpse. Another little thing that can stop you from your first down dog in the morning is having to slip into yoga outfit – one way around it is to sleep in your loose-fitting yoga dress. And if you can’t take your yoga gear with you when you travel, you can always exercise in any loose, comfortable outfit. Doing yoga outside can be a game changer, provided the weather allows it. If you’ve always been practicing indoors, try doing it on the balcony, in a park, or on the beach, and you’ll experience an entirely different feeling imbued by the beautiful scenery and natural sounds that can help you connect with nature and yourself. If you’re doing yoga early morning or in the evening, be careful of mosquitoes and any other bugs and consider using a mosquito repellent. If you’re traveling during the holidays, carrying your regular mat with you is one of the major hassles that can deter you from practicing. Even if you do manage to take your mat with you, using a full-sized mat might not be easy when you’re traveling and staying in a space-challenged place. Getting a travel mat is a no-brainer. A yoga strap is another handy thing that you can consider. It can not only help you align posture, stretch more, and do more poses, but also let you use it to carry your mat around. Holidays mean parties that involve large tables, large plates, and tempting foods and drinks. While depriving yourself isn’t truly healthy, but be mindful of what you’re eating and practice moderation. High calorie, sugar-rich foods, alcohol, and smoking can cause energy loss and weight gain. Moreover, the holiday season coincides with the flu season, so maintaining proper nutrition becomes even more important. Don’t ruin the benefits of yoga with poor nutrition. While the holidays are usually a time of festive fun, it’s easy to get overwhelmed with the dreaded holiday stress of shopping, cooking, cleaning, or whatever else it is you have to do. Yoga can be the solution to helping alleviate that stress, while helping you maintain good physical and spiritual health. Your yoga routine will keep your weight in check, physically detox your body, and keep the stress at bay. Previous Article Yoga VS Gym: Know which One to Choose for Yourself!